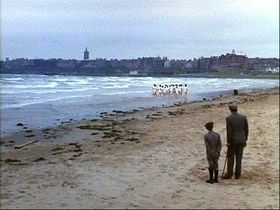 Is Chariots of Fire a good running track? The research basically determined that it’s an ideal motivational song for getting runners “in the mood” to perform well. It signals their brain to conjure up images of of being the hero, pushing through pain on a wide open beach while wearing too-short white shorts. And, that the tempo is not fast enough to have the same effect while actually running. The research also addressed the importance of having the correct beats-per-minute if you were to listen to music while running. It went on to list the top-20 motivational songs for running (according to only the researcher), which is all over the map in terms of beats-per-minute. There’s only one song on the list that’s remotely close to the bpm I need to match my cadence. The real problem with this research is that the author assumes runners have seen the movie, “Chariots of Fire”. If not, then how would the music conjure the correct images? Or, would it? That might be an interesting bit of research…is the music just a trigger for a movie-memory, or is there something organic about the music itself? What are your favorite running tracks?